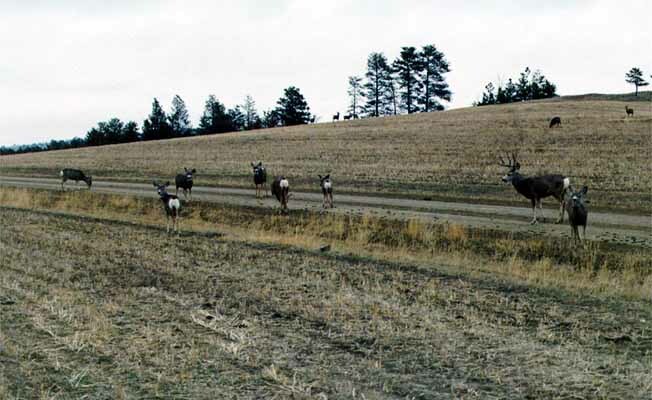 Established in 1951, the 7-V Ranch is located on the edge of the Missouri River Breaks and, because of our unique location, we can offer you quality deer and antelope hunting in widely diverse settings. We offer quality bow hunts for elk also. All hunting is done on the 120 square miles of privately owned or leased land and we offer the hunter a chance for a great hunt. All hunting is done by pickup or walking. In addition to the antelope, deer, elk, and buffalo hunting, we have a nice variety of upland birds, sage grouse, sharptail grouse, hungarian partridge and turkeys. After your tags are filled, there are scenic places of interest to see and photograph as well as prairie dog towns to look at in awe as well as try your luck. Or, if you prefer, you can spend your time fishing from the rainbow trout pond located just a few feet away from your cabin door. All hunts require a 50% deposit in the form of a cashier's check, the balance in cash upon arrival. We furnish excellent cooking and lodging facilities in modern, heated cabins. The hunter, of course, must furnish rifle, ammunition, sleeping bag and personal effects.